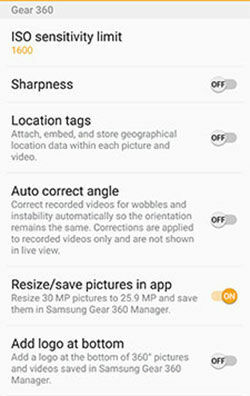 How do I configure the picture and video settings on my Gear 360? You can change different settings for the perfect shot. Note: The information provided is for devices sold in Canada. Settings, menus and screens may differ for products sold in other countries. Screens and settings available on your smartphone may vary depending on your Canadian wireless service provider and your software version. 1. Turn on the device by pressing and holding the BACK button. 2. Press the MENU button until Settings appear. Then, press the OK button. 3. Continue pressing the MENU button until the desired setting appears. Then, presss the OK button. For this example, continue pressing the MENU button until Video size appears on the camera status screen. Then, touch OK.
4. Continue pressing the MENU button until the display resolution you want to use appears. Then, press the OK button. 1. From the Home screen, touch Apps. 2. 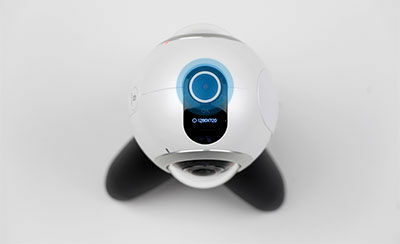 Touch Samsung Gear 360. 3. Touch the Remote Viewfinder icon. 4. To configure settings, touch the desired Quick Settings icon. For this example, touch HDR Off to set the HDR mode on. 5. To access the camera settings, touch the Camera Settings icon. 6. Review the different settings available and select the desired settings. Gear 360: How do I reset my Samsung Gear 360 (SM-C200)? 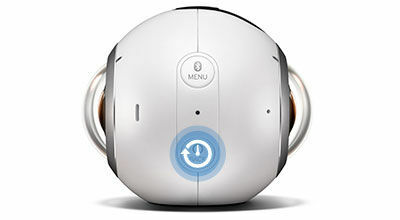 Gear 360: How do I connect my Samsung Gear 360 (SM-C200) to a PC to transfer files?